This photo was sent to me by Casy Goff. Notice the crumpled tissue and water bottle. Not only did she have to wipe her tears, she also had to drink water to rehydrate after weeping. I’m in the middle of reading My Mother’s Chamomile. I want to throw the book at your head. I’m bawling. My face is puffy from my sobbing. My EYES HURT! You’re breaking my heart. A college friend told me that she almost hated me. A cousin let me know that she’d reached the “I don’t like this phase” of the book. Another reader told me I owed her a box of tissues. I’m being completely honest when I say that I had no idea this book would evoke such powerful emotions in others. I mean, I can’t even think about certain scenes without completely losing it. I made my family leave the house while I wrote the end because I didn’t want to scare the kids with my sobbing. The writing made me fold over in my office chair, sick with grief. I’m not kidding. But I never expected it would happen to my readers, too. So, I’m sorry. And thank you. And…if you need a little pick me up, watch this. It might help. Just finished it over the weekend. One of the hardest books I’ve ever read (kinda like Unbroken). But, you just KNOW this one is not going to end well, at least not in the human sense. But, it IS a powerful testimony to faith, family relationships and the fact that there IS a better life after this one! Thank you, Susie! Thank you, Judy. I’m so glad that we have hope for more to come. Isn’t that the best? Susie .. yep, you still owe me a box of kleenex. BUT what made this book SO very good is it is SO real. The faith you lived through your words, your book and your characters is SO inspiring. The complete and total “realness” is what draws in me (a reader) and keeps me until that very last page.You have absolutely no way of knowing your reader’s private lives – but both your books have hit me in the gut. And it is REFRESHING and WONDERFUL to read your books and the complete faith. (I’m sure I didn’t say that right – but it made sense in my head. Please be a mind-reader for that). And I cannot wait for your next book. Already. Thank you so much, Beth. This means so much to me! Truly! And when I meet you one of these days, I’ll get you that box of tissues. Told ya so! 😉 If it can make Roseanna Who Never Cries cry, then it’s going to wreak havoc on the general populace. I plan on subjecting my bookclub to it soon. Maybe I should change my tagline to “If it’s got the name Susie Finkbeiner on it, you’re gonna want some Kleenex”. Hmm. Maybe I could get a corporate sponsorship. LOL! Corporate sponsorship would be hilarious. 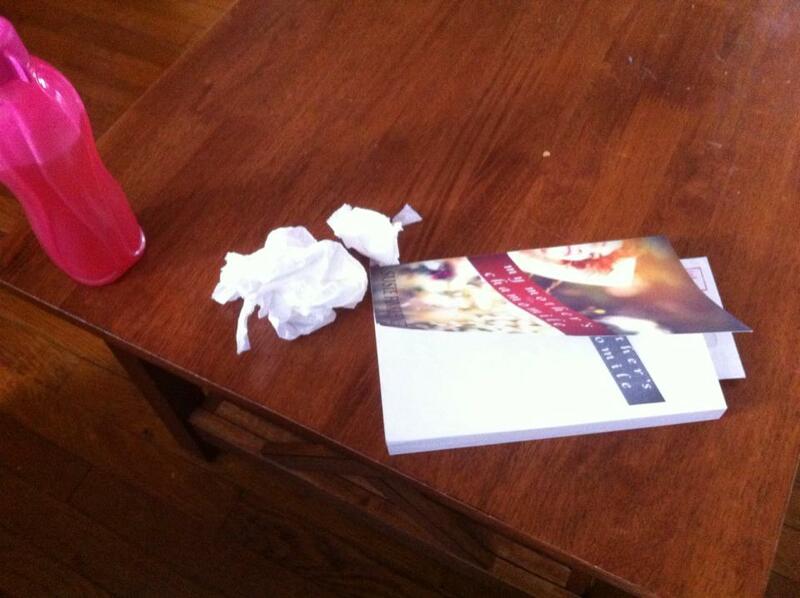 What do you think readers would do if they saw a “Sponsored by Kleenex” sticker on a book??? Oh Susie I cried a lot too. BUT your video makes up for it, you are forgiven. That video is a good pick me up, huh?